“Pink noise” is a specialized frequency with a specific relationship to human biorhythms that is said to increase focus and productivity. This concept provides the aesthetic criteria and an instigator for interaction in Pink Noise Pop Up—a research project initiated by Instant Coffee that embraces colour and sound as conduits for emotional connection. Pink Noise Pop Up will unfold simultaneously at Space One, an artist-run center, and ONE AND J. Gallery +1, a commercial space for emerging artists. Working within the context of both mainstream and alternative sites (in addition to the neighourhoods they occupy), the exhibition combines the aesthetics of consumer display with the improvisational play of social interaction. 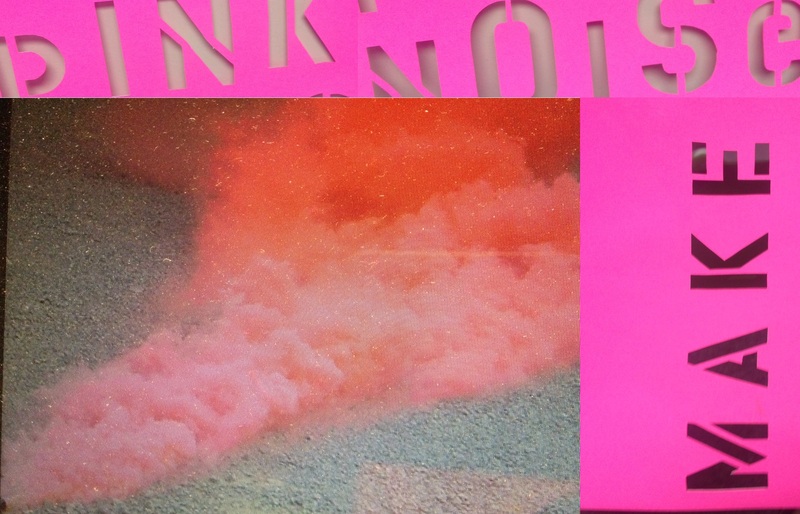 Check back here for updates on Pink Noise Pop Up. Opening: Friday, January 5, 2018, 7 – 9 p.m. Happening #2: Turkish coffee fortune readings and traditional Turkish Tahini Helva served. Date/Time: January 20, 2018, 2 – 5 PM. Happening #3: Akay family game from their great-grandmother titled, 1001 Fortunes and traditional Noah’s Pudding served. Date/Time: January 27, 2018, 2 – 5 PM. Location: grunt gallery #116 350 – East 2nd Ave. In January of 2018, grunt gallery will produce the exhibition “Ghost Spring” a two-person show by Dilara Akay and Derya Akay looking at funeral practices within their own family in Turkey, passing down information from one generation to the next. This mother and son team re-creates the rituals around death for some lives who are not considered grievable. 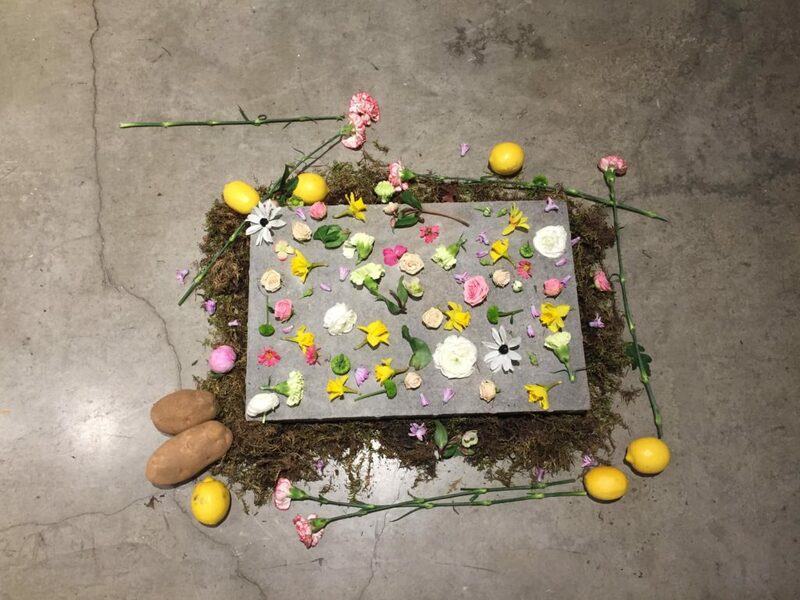 The artists will produce an installation and a series of activations that explore ways to deal with ghosts/griefs of many geographies/generations and experience ways to coexist— focusing especially on food that is presented to, and eaten for, the dead. The works in the gallery include garlands and flowers, texts and drawings as offerings to their ancestors. Born in (’63) Adana,Turkey lives and works in Göcek, Turkey. Graduated Bosphorus University (’85). Founder of artist platform HAYAKA ARTI (‘05) and alternative gallery project interfacegallery.com (‘09). Recent exhibitions include “Water is Life”, Santa Fe Art Institute (‘16); “Deaf and Mute”, Kuad Gallery, Istanbul, Turkey (‘16); Mardin Biennial, Turkey (‘15). Akay is an ambassador for Terzo Paradiso, a project of Michelangelo Pistoletto & Cittadellarte. Derya Akay (b, 1988, Turkey) is an artist living in Vancouver. He received the 2016 Portfolio Prize Emerging Artist Award in Vancouver. He has an upcoming two-person project with Dilara Akay at Grunt Gallery, Vancouver in January 2018 titled Ghost Spring and solo exhibition at Unit 17, Vancouver in May 2018. Recent solo exhibitions include with bread, Campbell River Art Gallery, 2017; Pumice, Del Vaz Projects, Los Angeles, California, 2017; Painting with Light, Kunstverein Toronto, 2015; Breakfast, Lunch, Dinner & Supper, Centre A, Vancouver, 2014. Recent group shows include The Lulennial II: A Low-Hanging Fruit, Lulu, Mexico City, 2018; Nature’s Way, Cooper Cole, Toronto, 2017; Here, Aga Khan Museum, Toronto, 2017; Ambivalent Pleasures, Vancouver Art Gallery, 2016. 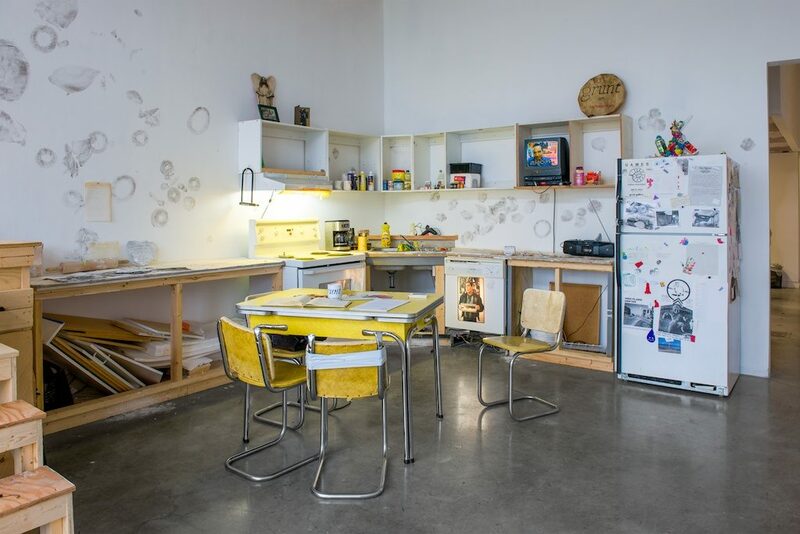 He recently completed his project Mantı, Börek, Baklava at the Burrard Marina Field House Residency program hosted by the Contemporary Art Gallery, Vancouver. For this project, Akay worked with elder women with immigrant backgrounds to host a series of cooking workshops and lunches open to the public. 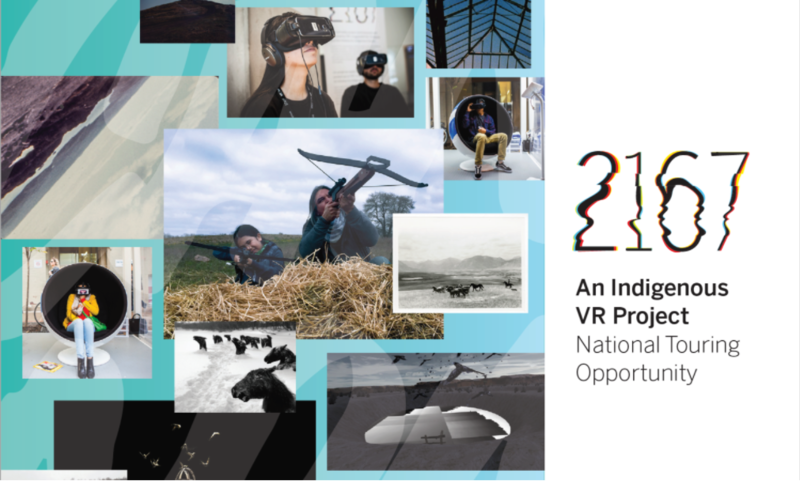 imagineNATIVE, in partnership with TIFF, Pinnguaq and the Initiative for Indigenous Futures (IIF), present 2167, an innovative virtual reality and immersive media project. Four Indigenous filmmakers and artists have been commissioned to create four VR works in 2017, with each artist asked to set their work 150 years in the future. Imagining northern New Mexico 150 years in the future, where American Indian and Xicano pueblos work collaboratively to exercise communal and regional self-determination, Each Branch Determined echoes sci-fi conventions of an apocalyptic future that gradually reveal themselves to be a series of managed processes intended to restore and manage the land and its resources, as well as community ceremonies seeking to culturally and socially actuate past, present and future. 6 min. Postcommodity is an interdisciplinary arts collective based in the Southwestern United States and comprised of Raven Chacon, Cristóbal Martínez and Kade L. Twist. The collective operates through a shared Indigenous lens that engages the assaultive manifestations of the global market. Through Indigenous narratives of cultural self-determination, Postcommodity braces against the ever-increasing velocities and complex forms of violence that have colonized the 21st century. Bringing to life a prophetic Anishinabe legend about a young boy who travels through a wormhole back to his people’s place of origin, Blueberry Pie Under the Martian Sky also addresses concerns about the revitalization, growth and evolution of the Anishinabe language. 5 min. The Hunt imagines a postwar North America in 2167 that lies in ruin, where the law is enforced by a fleet of automated orbs that patrol the skies. When an orb interferes with a man and his son on a goose hunt on sovereign Mohawk territory, it forces an altercation. 6 min. Danis Goulet is an award-winning filmmaker whose short films have screened at festivals around the world, including the Toronto International Film Festival, Sundance, Aspen Shortsfest, imagineNATIVE and Berlin International Film Festival. In 2013, her film Barefoot was recognized with a Special Mention from the Berlin International Film Festival Generation 14plus international jury and her film Wakening screened before the Opening Night Gala at the 2013 Toronto International Film Festival. She is an alumnus of the National Screen Institute’s Drama Prize Program and TIFF Talent Lab. Honour Dance is a virtual reality experience based on a 2008 five-channel video installation by Kent Monkman, Dance to the Berdashe. Set in a verdant meadow at magic hour, Honour Dance offers a contemporary re-interpretation of a traditional Indigenous ritual featuring the “Berdashe”, a gender-bending figure whose behaviour and very existence astonished and appalled European explorers of North America. Virile Dandies from the four directions invigorate the Berdashe with the vitality of their honour dance. Through this reciprocal and performative rite, the Dandies and Berdashe renew each other’s spirits, thereby refuting their obfuscation by colonial forces and Primitivism’s reductive pillaging of Indigenous cultures. 5 min. Kent Monkman is a Canadian artist of Cree ancestry who is well known for his provocative reinterpretations of romantic North American landscapes. Themes of colonization, sexuality, loss and resilience – the complexities of historic and contemporary Indigenous experience – are explored in a variety of mediums, including painting, film/video, performance and installation. Please visit the 2167 page for information about the projects on tour. Image: You won’t solve the problem with an air freshener (installation view), silkscreened paper installation. Photo by Dennis Ha. grunt gallery will host an exhibition with Montréal-based artist Dominique Pétrin – the artists’ first solo exhibition in Vancouver. Rooted in her practice as a printmaker, Pétrin creates immersive, highly graphic environments, often producing hundreds of individual prints for a single installation. 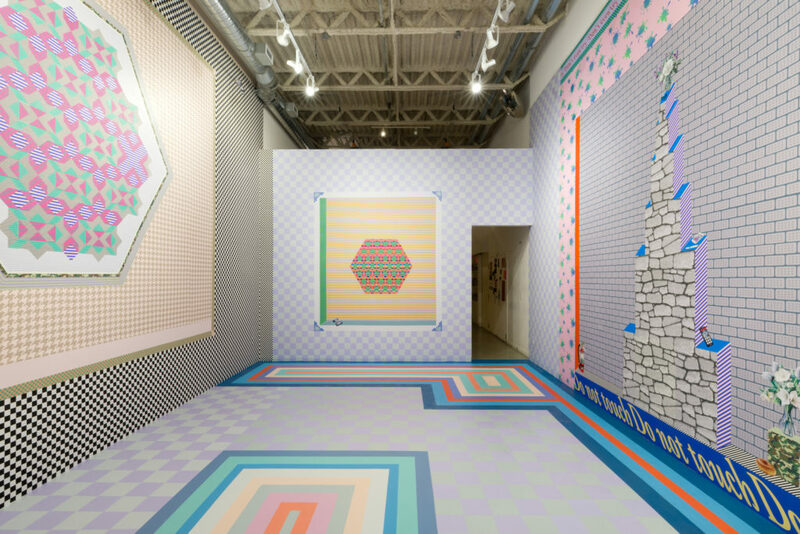 For her exhibition at grunt gallery, the artist will be working to create a unique installation that acknowledges the architecture of the gallery space. You won’t solve the problem with an air freshener will be created on-site and composed of silkscreened paper pasted to the gallery walls. Freely inspired by the history of ornamentation and pixelated digital aesthetics, Pétrin’s installations are often riotous in execution, creating an environment both vibrant and unsettling. Embedded in Pétrin’s maximal (as opposed to minimal) practice is a graphic insistence of the time and labour involved in the creation of her room-encompassing collages. Belying digital technologies capable of spawning image after image ad infinitum, Pétrin’s reproductions are executed, cut and collaged by hand. The artist’s recent exploration of quilting forms (in her exhibition Get rid of the fabric softener at Galerie Antoine Ertaskiran) establishes a more direct connection to the issue of gendered labour and the creation of a common “we” in the execution of communally determined, intergenerational aesthetic forms. Referencing textile-inspired graphics as a starting point, You won’t solve the problem with an air freshener, considers the root of shared identity via pattern reproduction, an emphatic counterpoint to the coolness invoked by endlessly (and one often assumes carelessly) proliferated digital imagery. Pétrin will be delivering an artist talk, presented in partnership with the Audain Faculty of Art’s Visual Art Forums at Emily Carr University, on October 31, at 6 PM. Dominique Pétrin is a multidisciplinary artist living and working in Montréal, Canada. A former member of the petrochemical rock band Les Georges Leningrad from 2000-2007, she has collaborated with artists such as Banksy, Sophie Calle, the Pil & Galia Kollectiv and choreographers Antonija Livingstone, Stephen Thompson and Jennifer Lacey. Her work has been exhibited across Canada, France, the United States, Belgium and the United Kingdom. In 2014 she was longlisted for the Sobey Award. She is represented in Canada by Galerie Antoine Ertaskiran. Download PDF: Obliterations, a curatorial essay by Vanessa Kwan. November 2017. Watch a portion of curator Vanessa Kwan’s interview with Dominique Pétrin. Technical Problem is an exhibition of mixed media drawings by Vancouver-based, Iranian-born artist Aileen Bahmanipour that explores cyclical political power and cultural identity. Bahmanipour’s work draws from Iran’s mythic history such as the story of King Zahak contained in the national epic poem Shahnameh written by the Persian poet Ferdowsi between c. 977 and 1010 CE. Zahak was cursed by the kiss of the devil with two snakes that grew out of his shoulders. According to the legend, he began beheading the youth of Iran to feed their brains to his snakes. Fearful of being bitten by the snakes, Zahak sacrificed the future intellectual life of an entire nation. The works in the exhibition reference Persian miniature painting, creating an allegorical language that shifts between the political reality of Bahmanipour’s home country, narrative construction, and personal symbolism. She elicits the contradictions between Iran’s mythic past and relationship to modernity as a utopic ideal in contrast with the state’s ongoing repressive control of its people. 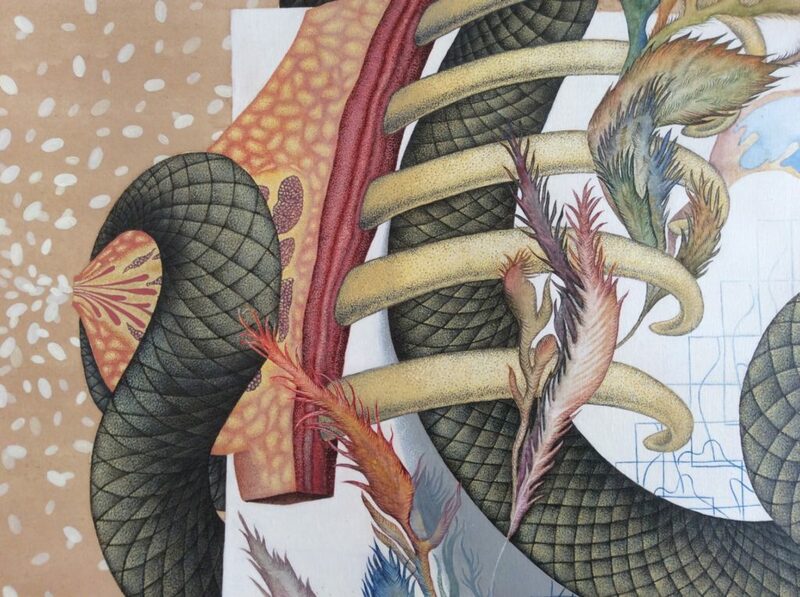 Medical illustrations and cross sections of limbs combined with animal and abstract forms mimic the border between the interior and exterior, and dissect the past as a reflection of the present. Bahmanipour’s work is both fantastical and meticulous, expressing a process of transformation unfolding and in tension. 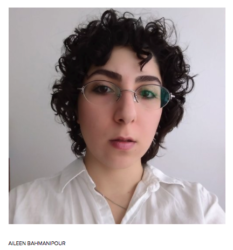 Aileen Bahmanipour received her BFA in Painting at the Tehran University of Art and is currently completing an MFA at the University of British Columbia. Bahmanipour’s interdisciplinary practice spans from installation to painting and video based works, examining hybrid dialogues between Western and Eastern perspectives in search of deconstructing cultural truisms. Bahmanipour has exhibited her work in Canada with the Banff Centre for the Arts, Gallery 1515, Hatch Art Gallery, and Two Rivers Gallery. Her work was included in the 12th Belgrade International Biennial of Illustration in Serbia (2013), and the 4th Painting Biennial of Damonfar, Iran (2012). She is a recipient of the Social Sciences and Humanities Research Council Scholarship, 2017. Image: Aileen Bahmanipour, Sucking My Tears (detail), 2014. Courtesy of the artist. “Ungalaq” is an Inuvialuktun word for the west wind. When the west wind comes up, tides rise and as the earth softens, things that are staked to the ground pull lose. Suddenly untethered, dogs run free and smoke houses drift up the beach. It is a period of unpredictability and, ultimately, of re-formation. Drawing from five bodies of work, this solo exhibition will be the most extensive mounting of Gruben’s work to date. Currently a Victoria based artist, Gruben has developed a strong aesthetic and practice of working with materials linked to her home in the Inuvialuit hamlet of Tuktoyaktuk in the North West Territories and to the Coast Salish territories of Vancouver Island. Her aesthetic practice can be seen as rippling outward from the land itself. She delves deeply into broad issues like climate change in a way that is both eloquent and pared down, pushing viewers to extend their own process of thought and interpretation, and allowing them to feel their way through each gesture of weaving, tufting, encasing, and assembling in her material process. 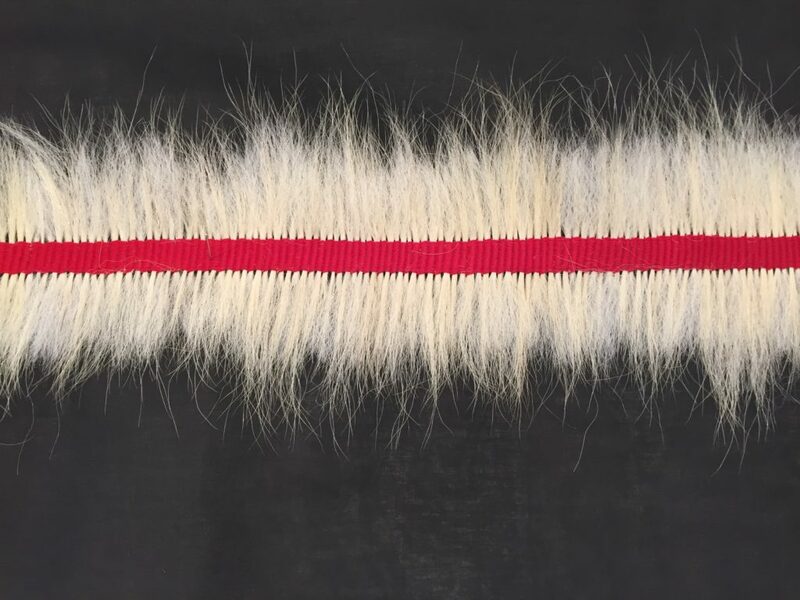 As an Inuvialuit artist her exploration of Indigenous materials variously includes polar bear fur, seal skin and whale intestines in combination with anodized aluminum, pvc, wool and other materials associated with industry. These substances do not function in binary structure of opposing traditional and industrial materiality. Rather, Gruben’s material sense reverberates throughout her choices, conceptually linking her experiences of home to ways in which materials are reused, re-appropriated and reimagined. This exhibition, Ungalaq, includes recently commissioned work, Stitching My Landscape made in Tuktoyaktuk (NWT). Stitching My Landscape is a part of LandMarks2017/Repères2017 (Landmarks2017.ca), created by PIA, presented by TD – A Canada 150 Signature Project. Download the exhibition catalogue with texts by Kyra Kordoski and Tania Willard HERE. Maureen Gruben was born in Tuktoyaktuk, NWT. She studied at Kelowna Okanagan College of Fine Arts (Diploma in Fine Arts, 1990), the Enʼowkin Centre in Penticton (Diploma in Fine Arts and Creative Writing, 2000 and Certificate in Indigenous Political Development & Leadership, 2001), and University of Victoria (BFA, 2012). She has been recognized by Kelownaʼs En’owkin Centre with both their Eliza Jane Maracle Award (1998/99) and their Overall Achievement Award (1999/2000). In 2011 she was awarded the Elizabeth Valentine Prangnell Scholarship Award from the University of Victoria. Gruben has most recently exhibited in the group show Blink at University of Victoria (2012) and Custom Made at Kamloops Art Gallery (2015). Born in Whitehorse, YK, Kyra Kordoski is now based in Victoria, BC. For the past year she has been working with Maureen Gruben as an artist assistant and writer, and has had the great privilege of spending time at Maureen’s home in Tuktoyuktuk as a guest on multiple visits. Prior to this she completed an MA in Cultural Studies at Leeds University with a dissertation on visual strategies of social resistance, and an MFA in Art Writing at Goldsmiths, University of London. While in London she organized and participated in Art Writing events at Whitechapel Gallery, X Marks the Bokship, and Goldsmiths University. Her writing has been published in various arts publications, including C Magazine, White Fungus, BOMB and Art Handler Magazine. She is currently also working to document artworks created as a part of LandMarks 2017/Repères 2017. Tania Willard, Secwepemc Nation, works within the shifting ideas around contemporary and traditional, often working with bodies of knowledge and skills that are conceptually linked to her interest in intersections between Aboriginal and other cultures. Willard has been a curator in residence with grunt gallery and Kamloops Art Gallery. Willard’s curatorial work includes the national touring exhibition Beat Nation: Art Hip Hop and Aboriginal Culture, co-curated with Kathleen Ritter at the Vancouver Art Gallery. In 2016 Willard received the Award for Curatorial Excellence in Contemporary Art from the Hanatyshyn Foundation. Willard’s selected recent curatorial work includes; Unceded Territories: Lawrence Paul Yuxweluptun, Nanitch: Historical BC photography and BUSH gallery as well as the upcoming LandMarks 2017/Repères 2017. Join us for an evening of Indigenous storytelling through the work of two powerful film and exhibition projects. Forty years ago, Justice Thomas Berger of the Supreme Court of British Columbia was asked to hold hearings into a proposed natural gas pipeline across the North Coast of the Yukon, along the Mackenzie Valley, to southern markets. He elected to hold hearings in thirty Dene and Inuvialuit communities along the Valley, where residents demanded that no pipeline be built until their land claims were settled. This was the first time that many southern Canadians had the opportunity to hear voices from the North, and a vociferous national debate about the pipeline ensued, the first shot in what has become a national discussion about resource development and Indigenous rights. Drew Ann Wake was a young reporter covering the hearings. Eight years ago she found her audio tapes and photographs from the time. She decided to return, with photographer Linda MacCannell, to the villages along the Mackenzie River so that young people could hear the voices of their grandparents and great-grandparents. Over the last eight years they have worked with teenagers in twenty-five northern communities, from Trout Lake to Tuktoyaktuk, to produce short films based on images and stories from the Inquiry. The result is Thunder in our Voices, an exhibition of images and films that span five generations of Dene and Inuvialuit history. The exhibition will be on display at the Indian Residential Schools Dialogue Centre on the UBC campus during the NAISA conference. During this screening at the grunt gallery, Drew Ann will be joined by Martina Norwegian of Fort Simpson and UBC professor Dr. Gordon Christie, originally from Inuvik, who will discuss how stories told by the Dene and Inuvialuit over 125 years continue to have an impact on the communities of the North. An audience discussion will follow. Four Faces of the Moon is a multi-media installation that provides a behind-the-scenes glimpse into the elaborate sets, puppets, and props created for the new stop motion animated film by the same name. The story is told in four chapters, which explore the reclamation of language and Nationhood, and peel back the layers of Canada’s colonial history. A personal story told through the eyes of director and writer Amanda Strong, as she connects the oral and written history of her family as well as the history of the Michif (Métis), Cree and Anishinaabe people and their cultural ties to the buffalo. Canada’s extermination agenda of the buffalo isn’t recorded as fervently as it was in the United States, yet the same tactics were used north of the border to control the original inhabitants of the land. This story seeks to uncover some of that history and establish the importance of cultural practice, resistance and language revival from a personal perspective. The exhibition catalogue includes texts by Kristen Dowell and Dylan Miner. Copies of the publication will be available for sale. Read more about the Four Faces of the Moon exhibition here. Gordon Christie is an Associate Professor of Law,Peter A. Allard School of Law, University of British Columbia; and is Director of the Indigenous Legal Studies Program. Professor Christie is of Inupiat/Inuvialuit ancestry and specializes in Aboriginal law. His teaching is primarily in the fields of Aboriginal law and legal theory, and his research work is entirely concerned with these two realms (and their intersection). His most recent work focuses on how colonial systems of cultural meaning frame Canadian jurisprudence around Aboriginal rights. Martina Norwegian is a Dene woman, born and raised in Liildili Kue (Fort Simpson) in the Deh Cho Region of the Northwest Territories, Canada. A leader in her community, she has advocated that consistency be the key for making a difference in local programs & services. As a First Nation member, her participation and advocacy for the “voices not heard” has always been a prime focus, whether in Education, History preservation and in the four quadrants of life. Martina served for many years on both the local and regional Boards of Education. She participated for 27 years in the promotion & preservation of history through the local Fort Simpson Historical Society. Their major accomplishment, through perseverance and dedication of local volunteers, has been the Fort Simpson Heritage Park: identifying local historical landmarks and building a museum which will house artefacts and information about the history of the Dehcho. Although the building is near completion, the real work has only just begun, as we strive to make the difference we want to see in ourselves and our communities. In the 1970s, Drew Ann Wake worked for the CBC and the National Film Board, covering the hearings of the Mackenzie Valley Pipeline Inquiry as it travelled to thirty Dene and Inuvialuit communities across the North. She subsequently began a career in exhibition design, creating museums and science centres across Europe, in the United States and Canada. She produced thirty educational computer games that ask players to resolve environmental and social issues. Returning to Canada, Drew Ann began working on her current exhibition, Thunder in our Voices, which incorporates interactive video shot with the Dene and Inuvialuit leaders who testified before the Mackenzie Valley Pipeline Inquiry. Amanda Strong is an Indigenous filmmaker, media artist and stop motion director currently based out of the unceded Coast Salish territory also known as Vancouver. She is the owner and director of Spotted Fawn Productions, an animation and media-based studio creating short films, commercial projects and workshops. A labour of love, Amanda’s productions collaborate with a diverse and talented group of artists putting emphasis on support and training women and Indigenous artists. The gallery is currently in between exhibitions. Join us on June 8th for the opening of Maureen Gruben: UNGALAQ (When Stakes Come Loose). 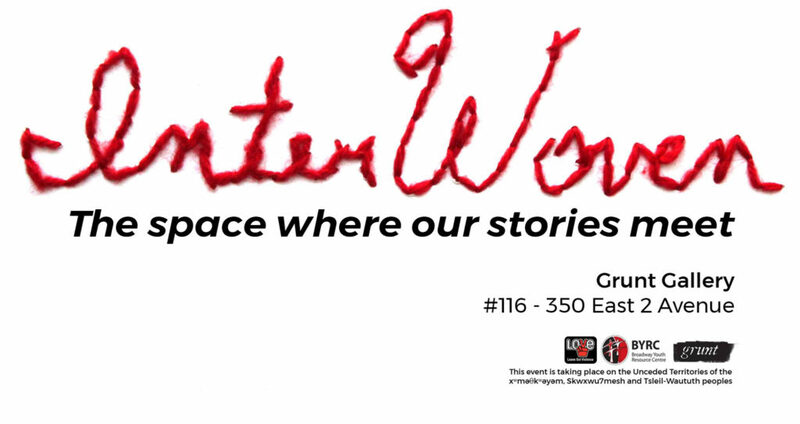 We are pleased to be hosting a community exhibition, InterWoven: The space where our stories meet, a youth art project where the artists explore the concept of intersections of stories and experiences. The youth learn about each other’s stories through various forms of art. Our stories are interconnected and woven with each others. The Interwoven Art Exhibition is a partnership between Leave Out Violence (LOVE) Society BC and the Broadway Youth Resource Centre hosted by grunt gallery. xʷməθkʷəyəm, Skwxwu7mesh and Tsleil-Waututh peoples. Brigitta Kocsis’ paintings blend realism, illustration and expressive painterly gestures in a chaotic and visually charged landscape. Her current series, Contingent Bodies, focuses on the representation of bodies in transformation – both organic and unfamiliar. The painting’s surface is used to transform energies and refabricate the body with suggestions of contamination, connectivity and displacement, reflecting Kocsis’ cultural history as a Hungarian, Romany and Canadian. Fragmented bodies emerge in the play between abstraction and figuration, embedded in perpetual rootlessness, containing exile and otherness within themselves. These polymorphic figures confront sexual and cultural categorization, recasting the body as part imaginary and part construct. Exploring notions of the cyborg and the prosthetic, these figures exist between the human and post-human, biotechnological and sexualized bodies, and the fashion industry and anime. Brigitta Kocsis was born in Sarospatak, Hungary, to a Hungarian father and a Romani mother. Kocsis works in multimedia installation, video and painting, which integrates abstract and figurative elements. Her work has been included in group and solo exhibitions nationally and internationally, including the Geneva Art Biennale; the Balassi Institute, Finland; Szeged University, Hungary; Harcourt House, Canada; Okotoks Art Gallery, Canada; and the Burnaby Art Gallery, Canada. She studied drawing at the Studio For Young Artists (Fiatal Muveszek Klubja-FMK), attended the Marczibanyi-teri kor (Marczibanyi Education Center) in Budapest as well as Concordia University in Montreal. She received her BFA from Emily Carr Institute of Art and Design in 2005. Kocsis lives and works in Vancouver, Canada. Download the exhibition handout with an essay by Clint Burnham here. Funding for this project was received by the Hamber Foundation. Image: BK12, 2015, acrylic on canvas. Three Cities: Prayer and Protest is a shadow-based installation that investigates sites of tension, controversy, and contact within three cosmopolitan environments. Inspired by recent cities the artists have lived and worked in (including Istanbul, Montreal and Vancouver), the exhibition explores notions of prayer and protest as communal expressions of personal hope, desire, demand and outrage. Each ‘city’ becomes a palimpsest in which layers of social, cultural, economic, and political differences come into dialogue. Made from intricately cut paper sculptures, each city is presented as as “island”. These islands are explored by the viewer with the use of mobile lights created for the installation. As the viewer moves through the space, the miniature paper imagery comes alive. Large scale shadows fill the gallery walls and the viewer, who was initially towering over the fragile paper cities, is now surrounded by layers of giant shadow. Audio composition by Chris Carrière. Performances take place every 20 minutes during event hours. Very limited capacity. Inspired by the Hieronymus Bosch painting of the same name, this is an experience of the city as rendered in darkness. In this immersive journey, viewers are guided by shadow projections and sound cues to bring a procession of dreamscapes to life. With specially designed light wands, spectators move from a lush tropical jungle to an urban one encountering characters, at times absurd and fantastical amidst fight, flight and displacement. The cityscape appears as shadows on the wall, becoming an abstraction even as its physical essence is laid bare. Mere Phantoms takes 16th century notions of heaven and hell and welds them to a modern inquiry. Is this fantasy or nightmare? Decide for yourself as you experience the magic via light and paper. This is illusionism at its finest—refined down to a beautiful binary of black and white. This exhibition is graciously supported by the Conseil des artistes québécois. Mere Phantoms is the Montreal-based duo Maya Ersan and Jaimie Robson, who are inspired by early cinema, papercutting and shadow theatre. Their work has appeared internationally.